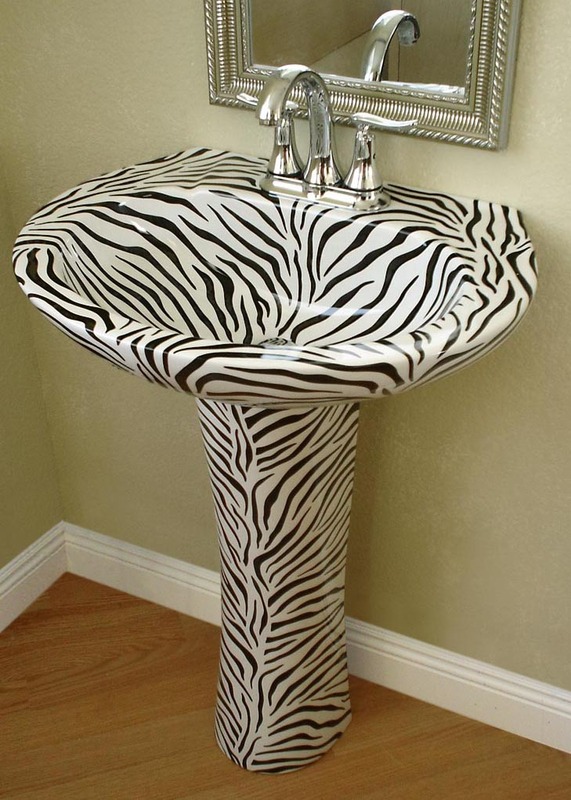 This post features a little jungle-inspiration for the bathroom and If you like animal prints, this sink is for you. It’s just one of the hand-painted and decorated sinks we have in our collection at decorated bathroom. All made by me, by hand in the USA and many of the actual fixtures are made in the USA too, in beautiful California, although it does have some problems right now. I went for a factory visit where they make the sinks in Oxnard, California, and there was a whole line of ramshackle campers and trailers along the street where people were living. That can’t go on, do they all have to leave California? then who is going to do all the jobs there, they need affordable housing. Tiny houses!!! I’ve been fantasizing about them for30 years plus. I always wanted a little ‘Wendy House’ in the garden, that’s what they call them in the UK. I could live in a tiny house, then I need at least 1500 square feet for a studio, kiln room, sink storage and shipping dept. Fortunately I live in a decent house in Seven Hills in Henderson, I can’t complain, but I am sick of all the rocks. If you like animal prints, we also do a Leopard sink with an equally gorgeous leopard design. Let’s get to the Zebra and Leopard Bathroom. The sink glistens in black and white against the leopard wallpaper. 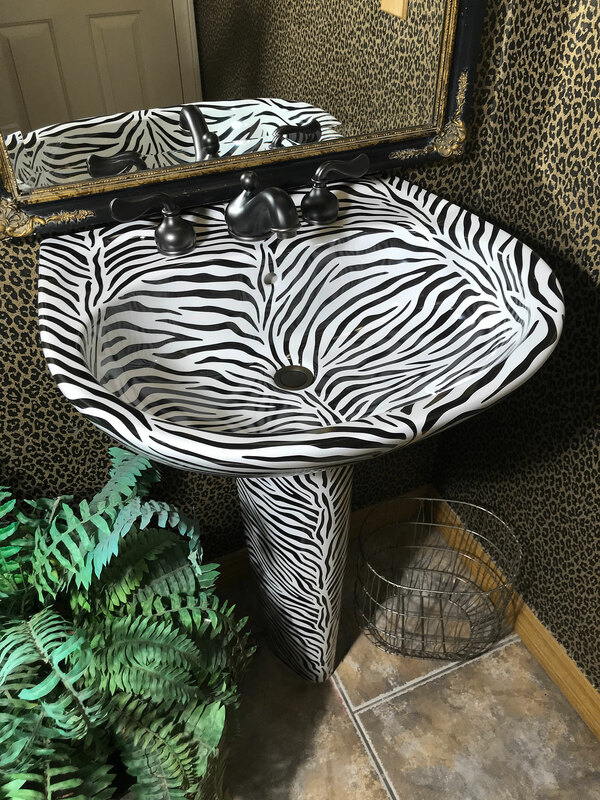 The customer already had the wallpaper and bathroom done, she just wanted to replace the fixture and I just knew the Zebra Painted Pedestal Sink was a great fit. The wallpaper is a lovely leopard print with a slight texture to it, totally luxe. I like the almost black faucets and antique-style black mirror with gold accents. Nice wastebasket too. 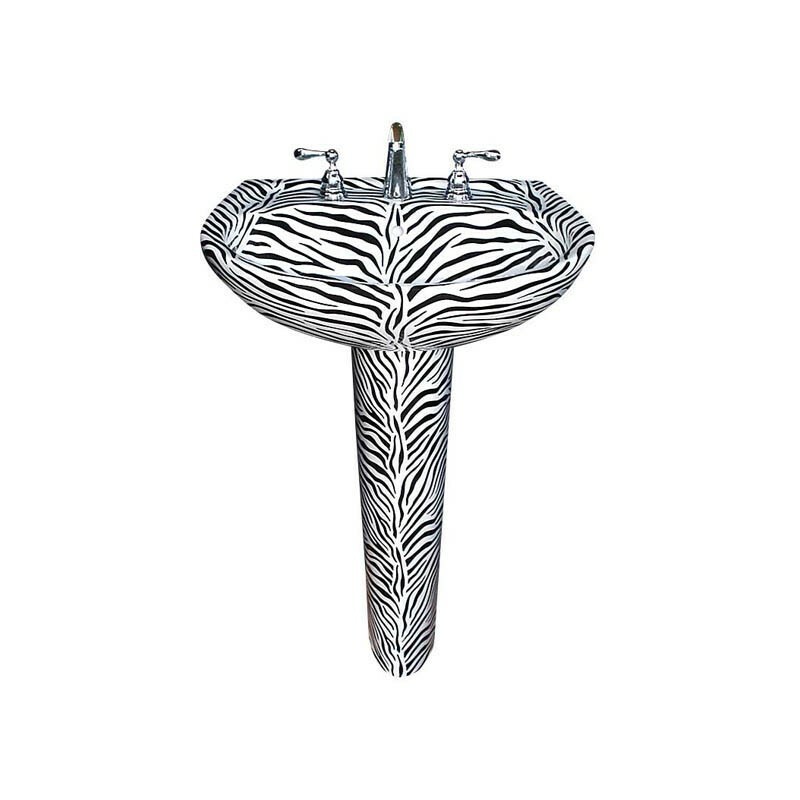 Zebra design painted on a contemporary Toto pedestal lavatory. The fixture is a Toto pedestal and it’s a big one, 24″ wide. I really don’t do them that big anymore, too hard for me to lug around and put in a top loading kiln. The sink is painted with the Zebra design all over it. Not actually painted by hand, more like applied by hand, every single stripe!! I made the artwork on the computer, in Illustrator, and then have SDI Custom Decal, in Hawley PA print ceramic decals for me. The decals are made up of finely ground up glass pigments, suspended in a medium. Once fired in the kiln, all the medium and binders fire away (they totally stink) and the pigment and design remains, permanently fused to the surface of the china once it reaches temperature in the firing process. It the same kind of process that is on plates and mugs. Very durable. It won’t wear out or fade away with proper care, which is nothing abrasive. Just like a mug you start using an abrasive on to get the coffee or tea rings out, after time the shine will wear off the finish. 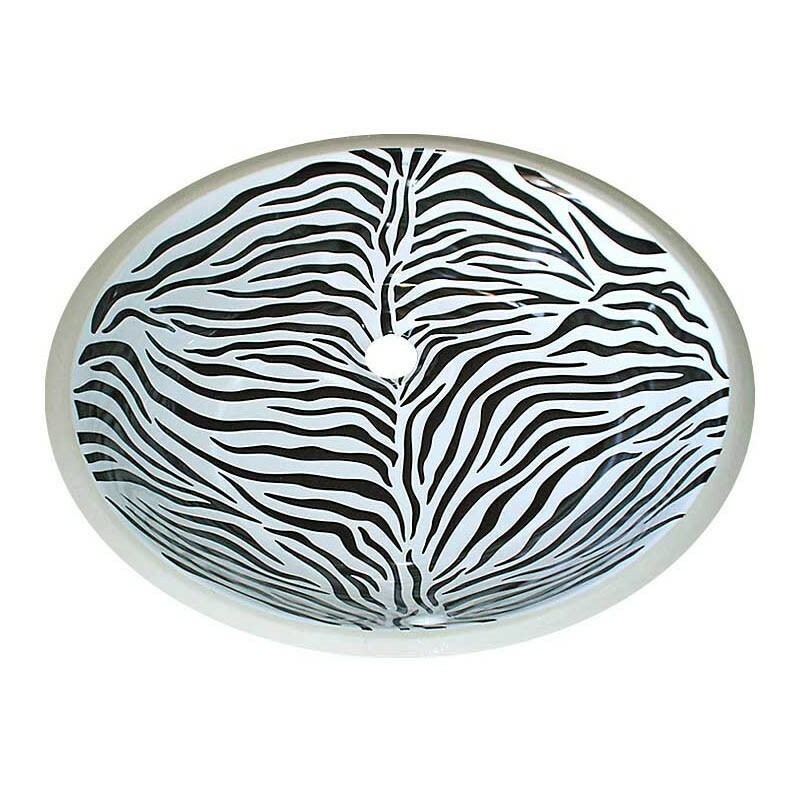 Top view of the Zebra design painted on the pedestal bowl. Here’s another photo of the top of the sink. What else can I say? Lookin’ good. This was the first sample sink I made in the design so it’s on a no name generic pedestal from Home Depot. It’s really quite a nice little sink for a small powder room. 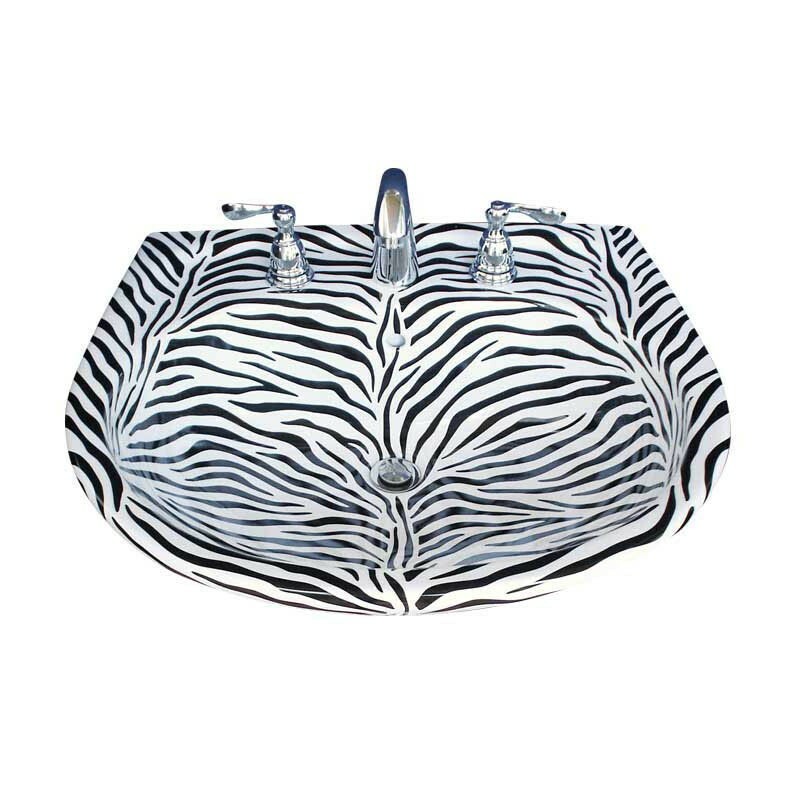 The Zebra design painted on a white 17 x 14″ vanity sink.